The predicted rain belted down during the night and into the morning. After a hot drink (coffee – Jan, cocoa – Tom) we reversed off our mooring and winded before stopping on the water point to fill the tank and dispose of the rubbish. Part way through filling the tank we remembered the plan was to have a pump out today and having the bow high in the water would assist in empting the toilet tank in the stern. Consequently we stopped filling the water tank. It’s been more than a month since we last had the toilet tank emptied and the gauge wasn’t showing it half full. However with winter coming we want to ensure there is always at least one month of surplus capacity in the tank. 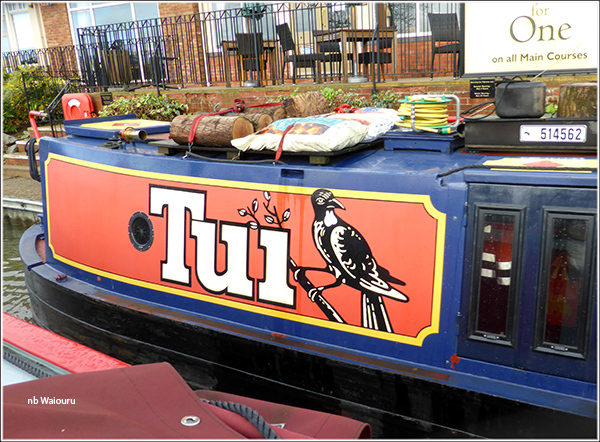 Departing Braunston on tick-over we passed nb Tui moored near the junction. If you go to the Tui Breweries website <link here> you will see the corporate branding has been copied. The sun put in an appearance not long after leaving Braunston and stayed with us for the rest of the day. Half way down Barby straight we turned right into Barby Marina for the pump out (£15). It was a good pump out. The marina is slowly being developed. I did wonder why the services wharf was at the opposite end of the marina to the office. However the member of staff informed me the plan is for the office complex to be built adjacent to the services area. I did ask the price of fuel and was informed it was £0.92 (domestic). Exiting the marina proved to be easier than the entry as we had the wind in our favour. 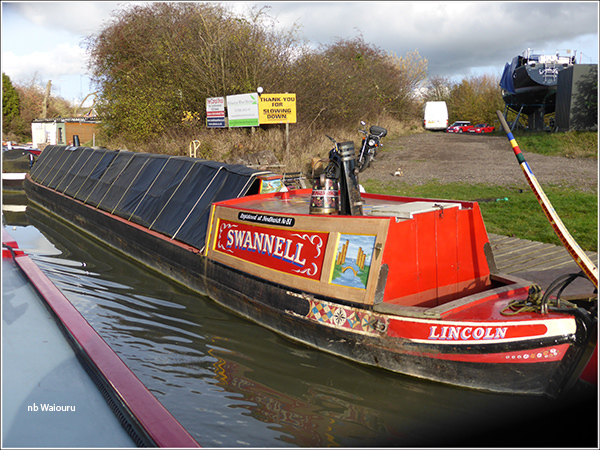 On reaching Hillmorton Wharf Marina we noticed Butty Swannell appeared to be taking on bagged coal. The sun was in my eyes as we passed The Canal Shop but I think their price for diesel was £0.79 (domestic). 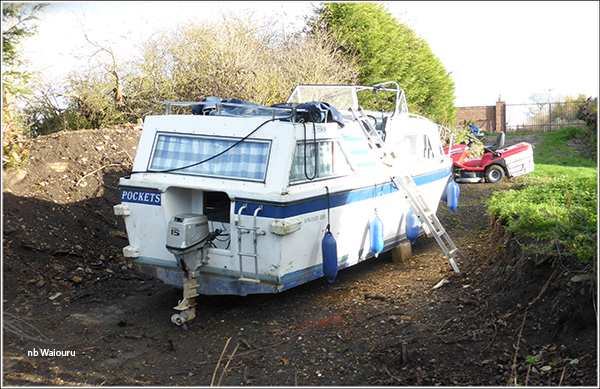 Last year we had noticed the fibreglass cruiser Pockets cruising or moored in the immediate vicinity of Rugby. Today we noticed her as we navigated the bend just north of Bridge 72A. I could fallaciously claim this is what can happen when you attempt to navigate a bend at excessive speed. Looks like a significant effort has been made to construct a ramp to extract her from the canal. The batteries were reading 100% so we stopped for the day above Hillmorton Locks. The mercury fell when the sun disappeared around 4.30pm and consequentially the Refleks was lit. We’re now all tucked up dry and cosy. Before finishing this post I must mention the blog reader on nb Thomas Tallis who passed us when we were moored above Calcutt Locks three days ago. He spoke to Jan mentioning he had read the blog and knew about our rough start to narrow boating. Sorry we didn’t get you name. And yes…. we are still enjoying it!